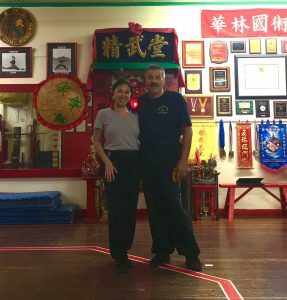 I’ve been meaning to write a recap of my training weekend in Boston with my Si Hing (older kung fu brother), Sifu Bob Rosen. However, we had a little storm named Irma come through and kind of threw things of track. The Labor Day weekend was time I had designated to do my personal training. A little ‘me’ time! As I stated in previous posts, even instructors have to test, and maintain their material. One of the vows that I made at the last test was to spend more time training with my peers, which meant that each year I would go to Boston to connect with my Si-Hing Bob Rosen. (I also tried to get my Orlando brothers to go too; Sifu Tu joined me on this fun weekend) The end of the year was quickly approaching, and I saw an opportunity with the holiday weekend. 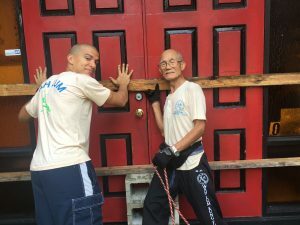 It turns out to be great timing for Sifu Bob because he closes the school to clean, fix, and regroup for the fall. I know many of you are imagining really crazy ‘secret’ kung fu training that might have taken place; consisting of levitation, flaming weapons, etc. Sorry to disappoint. I like to go over fundamentals and delve deeper into my understanding of the forms. We collaborated on ideas for self defense applications, technique, and practiced advanced forms that we rarely teach. (so ok, some secret cool kung fu stuff) I am so appreciative to have such incredible kung fu brothers that are willing to spend time with me. I learn so much from them and feel fortunate to have such knowledgeable brothers. 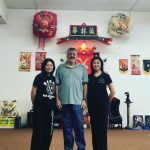 Sifu George couldn’t make it this time, but he will definitely join us next time. The Orlando crew often gets together though, and hopefully we will be able to train more often. Per tradition, after training you eat! Having lunch in Boston chinatown is special for us because it is so nostalgic. I love being in Boston because it makes me feel closer to my father, knowing I am walking the path that he once walked everyday. The best part about being in Boston? I do not have to ‘worry’ about my students. 😉 We all love teaching, but we also love kung fu. Once you become a Sifu, personal training time requires strategic planning and prioritizing. I had to travel all the way to Boston to get away! I know people often think… “but you are at the Temple all day! You can train when there are no classes.” Unfortunately, that is not my reality. Running the Wah Lum Temple and the Wah Lum System consists of many administrative tasks, meetings, planning, etc. It is certainly a challenge and hard work on a daily basis. But then again, that is kung fu too. The last part of the trip consisted of a little bit of official business, but it was something I was excited to do. I visited two new locations while in town. Wah Lum of Quincy’s brand new location and Wah Lum of Taunton’s relocated building. 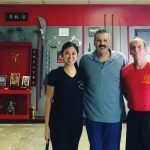 So proud of our growing Wah Lum Family! 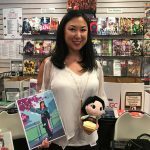 A fun interlude for the weekend was an event at Paper Asylum, Pete K. of Wah Lum of Boston‘s pop culture store. I did the Mulan appearance bit: signed autographs and took photos with fans. They had a fun cosplay group out there to add to the Disney theme. 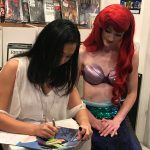 Confession: My favorite character is Ariel, and her asking for my autograph was pretty amusing. On my way back to Orlando I heard the news of the gigantic storm headed our way: Hurricane Irma. I usually try to keep calm during storm warnings, because while one has to be prepared, it doesn’t help to panic. I returned on Wednesday evening, and there was no water or gas, and the city was madness. I started imagining scenes from Mad Max… and decide which character I could be. First I had to decide which film… well, let’s say it’s the most recent one for our younger readers. Obviously, I am Furiosa (based on the name alone), and O is the guy hanging off the truck playing the electric guitar. ha! Ok, I digress. 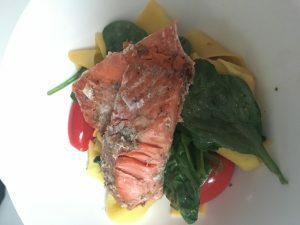 Jerk Salmon over egg papparadelle with spinach and tomatoes. had lost some strength, but still made an impact. Yes, we were without power. (Oh no, the world is ending we have no electricity!) However, we had running water, and that was fine by me. O and I had a lovely candlelight dinner on Sunday, as I had a butane stove to cook our meal. Not too shabby for a hurricane powerless meal? The winds were howling at 3:00am on Monday morning, and I knew Irma had arrived. My anxiety wasn’t for my home and possessions, but for the Temple. I always worry about the Temple (as does my dad). The steel building could’ve been gone in an instant, had a tornado decided to take it away. (we get a lot of tornadoes when there are hurricanes) We prepped the Temple the best we could, but honestly there wasn’t a lot we could do except hope for the best. In 2005 during Charley we got lucky because a tornado came through and tore up the street. Had that tornado decided to be a few feet over, the Temple would’ve been gone. I’m certainly not trying to diminish the devastation that so many have felt, with 82 fatalities, and over 60 billion in damages and counting. My heart goes out to all who have lost their loved ones or homes. I can’t even imagine being on Barbuda as 90% of the entire island is now destroyed. I was just in lovely Saint Martin earlier this year, and my heart goes out to them especially. I feel fortunate. I am so lucky to be in Orlando where we always seem to ‘just miss’ the wrath of the storm. Yes, there was some damage, and yes, I was without power for 5 days. But I had running water, food, and was able to borrow generators to keep my food from spoiling. Inconvenient? Yes. However, seeing the images of entire homes leveled or floating away reminds me of how fortunate I am compared to others. The Temple survived another storm. We feel that the bamboo and our ancestors always protects the building. The bamboo is flexible and sways with the wind versus causing any resistance or fighting against it. This is something I am also trying to be better at. I need to learn to be flexible… to flow with the wind… and hopefully I will endure as the Temple has. 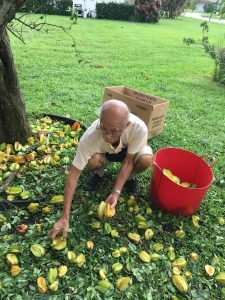 Our starfruit tree from my first blog post was a bit shaken, but we quickly gathered the salvageable fruit to share with others. Featured image above is my ‘mantis signal’ that I sent out when the storm started. 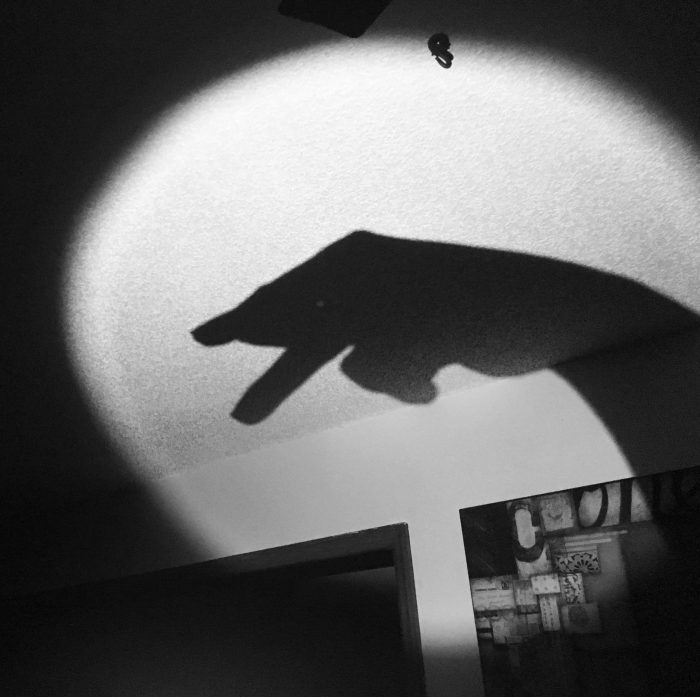 We lost power and I started doing shadow puppets. Oh what fun.